Hello my lovelies! It's Saturday and I'm having one of the best weeks in years. The weekend will be nothing short of amazing, I'm sure of it. Just a quick post today to show you one of the polishes I've picked up on my trip to Amsterdam. It's an old Kiko color that I didn't even know about until I saw it in the shop and it had to come home with me. It's simple but beautiful in all its simplicity. These are also the last pics I took with my old camera before I got the new one. Let's take a look! 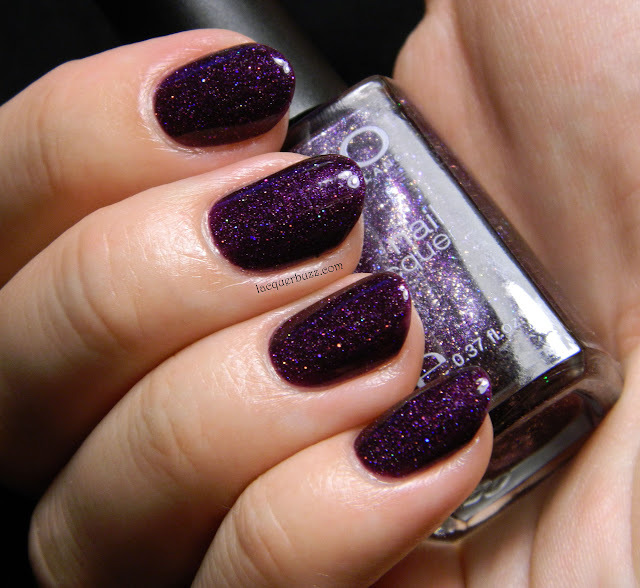 Like all Kiko polishes, this one has the number on the bottle but you have to search their website to find out its name, which is Violet Microglitter. The term microglitter is not quite accurate because what we have here is lots of silver holographic shimmer in a dark purple jelly base. The concept is simple and there are many similar polishes out there but I still love this one. Perfect for fall and winter! The formula was amazing as usual and it only took two coats to make it opaque. I'm in love with the huge amount of shimmer and the way it shines through the purple base. The purple is dark and vampy, but still light enough to not look black. It really doesn't get any better than this. Of course I added a coat of Seche Vite on top to make it look extra shiny and nice. I didn't add any nail art on top of this because it was just too beautiful to be covered up. I really hope you enjoyed these swatches and may your weekend be sunny and amazing!